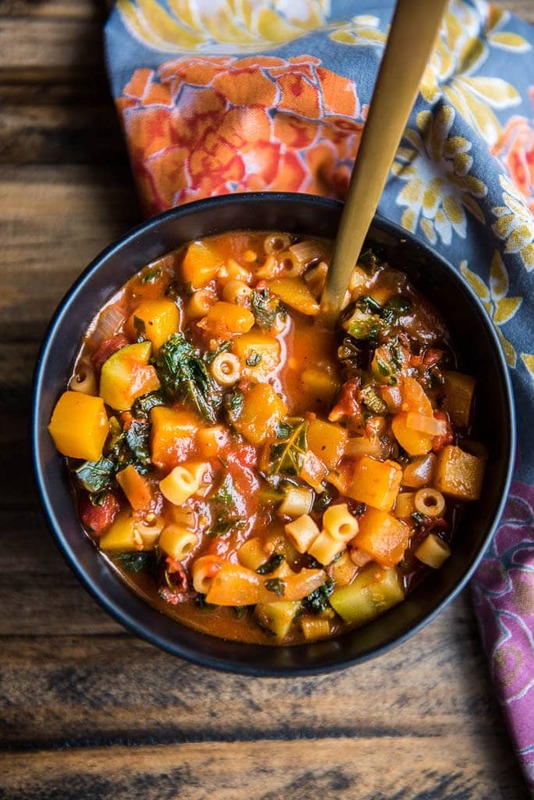 Rich, hearty and filling for those cold winter nights, this Butternut Squash Minestrone is vegan and comes together in about 30 minutes! Do you follow me on Instagram? I’ve been posting my daily cooking adventures in my stories, and pretty much every one of them over the last week involves soup. We went from what felt like an endless summer to a sudden plunge to winter and I’ve pretty much been freezing ever since. But the up side is really the soup. I’m a self proclaimed soup junkie and while I do keep making some of my favorites over and over again (Buffalo Chicken Chili, anyone?) I’ve also been venturing out into new territory. 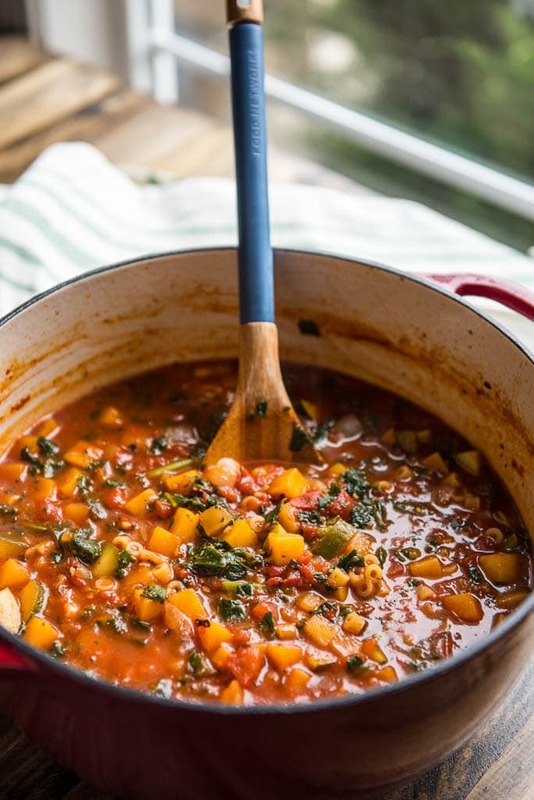 There’s been a few fails, but this Butternut Squash Minestrone is certainly a winner! 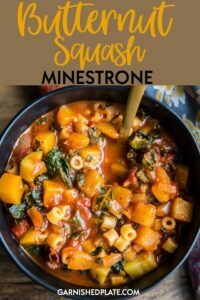 Besides loving soup, I’m a huge fan of pretty much any squash and butternut squash is a natural choice for a soup like this. 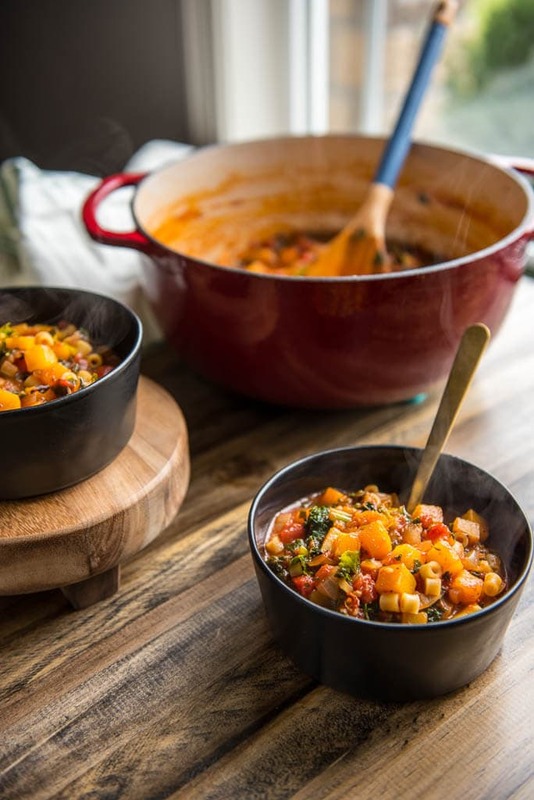 Just a little bit of sweet and plenty of hearty flavor, it’s perfect for so many meals. The only downside to butternut squash is the work involved, so I’m just going to be totally transparent here and totally admit to cheating. 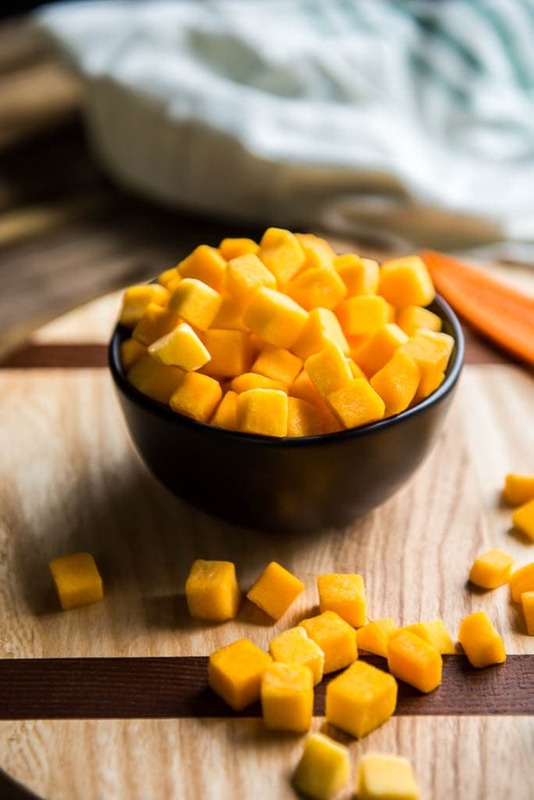 I wanted this meal on the table quick, and those little packages of already peeled and cubed butternut squash in the produce department at the grocery store were calling my name. I say, no shame in doing what you’ve gotta do to get a healthy meal on the table. 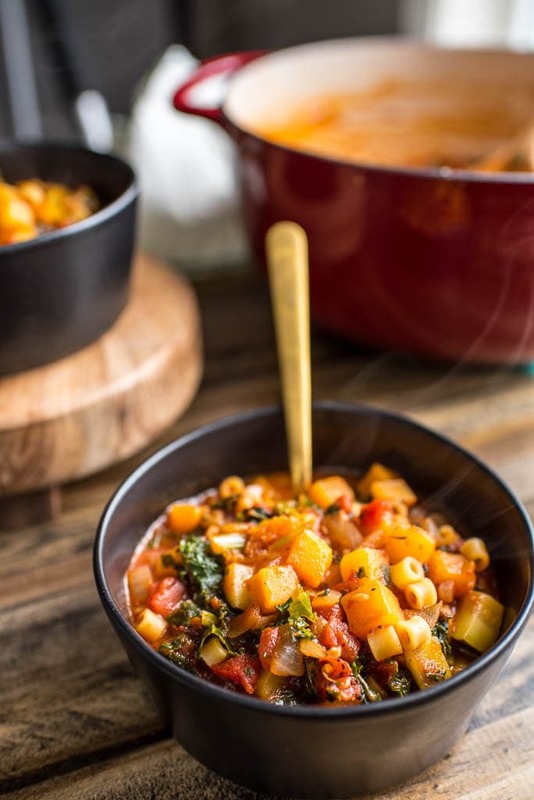 I usually make my soups in the slow cooker, but sometimes you need to get them done quickly or they just lend themselves better to a quicker cook on the stove. I finally decided to invest in a new larger dutch oven and can I just say I love this one?! I didn’t want to invest a ton of money, so I ordered this Lodge Dutch Oven from Amazon and it’s amazing. Heavy, well-made and easy to clean so I know I’ll be using it a lot. Also included in this soup? Some white beans (which besides black beans are my favorite). You could also go with garbanzo if that’s your thing, but I recommend beans for some added protein. Also, some crushed tomatoes and zucchini as well as the typical onion and garlic. I used frozen chopped kale to keep up with the theme of being easy and the whole soup came together in about 30 minutes. 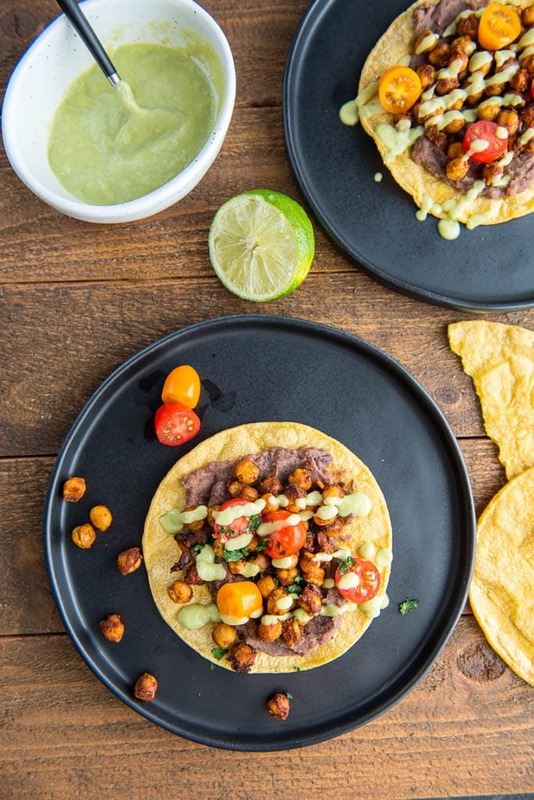 How about Crispy Chickpea Tostadas!